Engineering college seats were highly competitive and getting into an engineering college was a guarantee for a successful career for life. Not anymore! Many engineering colleges are either being closed or the number of seats remains unfilled! For decades, an engineering career has been a choice by default for almost any student passing his/her school education. Engineering college seats were highly competitive and getting into an engineering college was a guarantee for a successful career for life. Not anymore! Many engineering colleges are either being closed or the number of seats remains unfilled! A degree in engineering is no longer guaranteed to give you a job security and some of the qualified engineers are unemployed or working in non-technical underpaid positions. Closely examining the job trends and our workforce tells us the picture is grim not just because of a downslide in the job market but also due to an education system which has been slow to react to the emerging skills in demand and also shown a surprisingly callous attitude in terms of the development of actual skills for which courses were offered. Primary agency regulating technical education in India is All India Council for Technical Education (AICTE) and it has aggressively moved to change the situation. Efforts made by AICTE and the educational institutions have been two-fold. First, they have attempted to improve the existing courses and infrastructure in engineering colleges. The efforts in this direction included the introduction of strict quality controls on courses and ordering of closures where content delivery and infrastructure were only producing abysmally unemployable workforce. Secondly, aggressive guidelines and efforts were made to promote practical skill development rather than classroom teaching. Instead of basic engineering, actual project work has been encouraged. A number of internship programs were introduced to achieve that goal. The industry association has been especially intensified. Furthermore, engineering students are now prodded to develop their own start-ups. 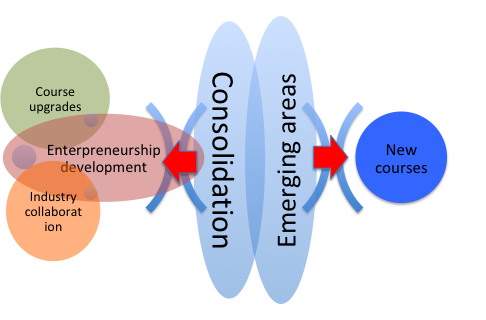 The policies and programs of the states and central governments have supported these activities. Lots of funds are becoming available for students with innovative and entrepreneurship ideas. To prepare a workforce to make the best use of such opportunities, entrepreneurship is directly entering into the curriculum of technical education. In addition to the enhancement of existing courses and curricula, emerging skill sets needed by the industry needed to be identified. This has led to the introduction of courses in new skills. Some of the areas of interest for the industry include courses on Mechatronics, Instrumentation, Biomedical Engineering, Power Electronics and Industrial design. Many of these areas are interdisciplinary in nature and have developed rather slowly due to a fragmentation of skills into core areas. As of a current trend, specific examples is that of Electric engineering courses, which have seen a diversification and fusion with other areas leading to the emergence of subjects such as intelligent instrumentation, artificial intelligence and robotics and Bioinstrumentation. Due to the emergence of data analytics and machine learning, as skill sets highly in demand, a mathematical component to engineering education has gained prominence. Thus, some courses have been started with stronger components of mathematical and statistical computing and modeling. We have picked up a list of coveted and sought after courses, which have a great potential for the job market. Despite an apparently gloomy picture emerging from the report above, Engineering remains one of the most preferred qualifications for recruiters across the board. They are employed not only for their core skills in the subject they study but also for generic tasks of management and policy-making. We present a survey of engineering jobs currently posted on a widely used website (www.naukri.com). As many as 114,000 job vacancies were reported, when a keyword search using the term “engineer” was performed. A diverse skill set and industries looking for engineers were observed. As has been the trend for the last many years, Informational Technology and software related jobs top the list, followed by construction industry jobs. Those in the non-engineering industries such as Recruitment, Banking and E-commerce supplement the traditional jobs of the automobile, electronics engineering etc. Within the engineering branches, a large number of jobs come from the fields not taught at the undergraduate levels, even though employers may be willing to take the beginners in some cases. Among the hiring companies, several Biomedical companies such as United Health Group, show up on the top. 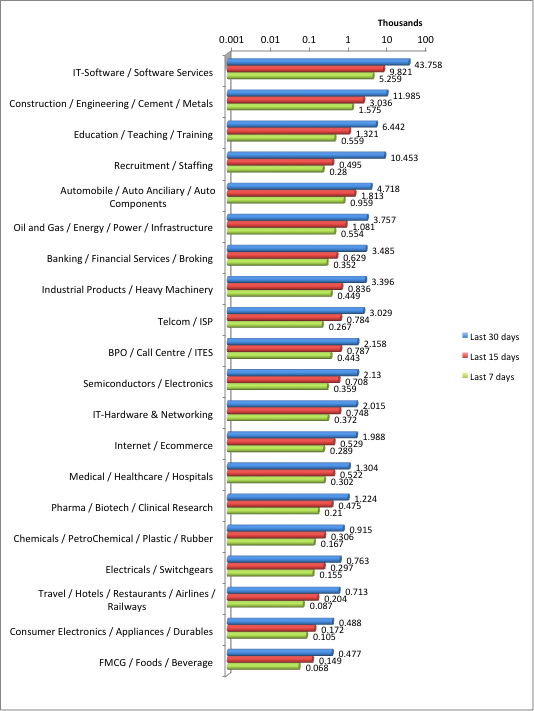 Finance companies such as JPMorgan, communications companies such as BhartiAirtel and IT hardware companies such as Nvidia remain some of the top employers of Engineers (see the Table below). 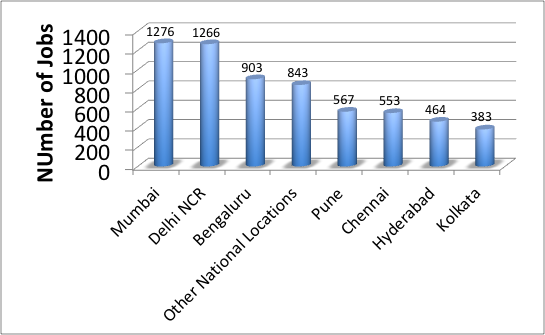 Geographical distribution of engineering jobs presents Mumbai, Delhi NCR, and Bengaluru as the top destinations for jobs for engineers. Pune, Chennai, Hyderabad, and Kolkata also appear popular for employers. Thus, we observe that there is still significant demand for engineers across industries and disciplines. The problem remains in terms of poor training, lack of industry interactions and slow pace of starting courses in new areas. All these fall in the purview of engineering education, where more efforts are underway.